One thing to always keep in mind in hockey: you can never count a team out of a playoff series. No matter what happens early on in a series, it’s never over until it’s over. We’ve seen teams come back from down three-games-to-none to win the series enough times to know that it’s a true statement. A playoff hockey series can turn around in an instant, no matter how badly a team has been beaten down in the first couple of games. This is something to keep in mind as the Boston Bruins and Toronto Maple Leafs make the shift to the Air Canada Centre in Toronto, with the Bruins leading the series 2-0. But with that being said, it doesn’t change the fact that the Bruins unleashed an absolutely vicious, relentless attack on the Maple Leafs in Games 1 and 2 at the Boston Garden. They showed absolutely no mercy. In back-to-back games to kick off the 2018 playoffs, the Leafs came into the Garden and were brutally shellacked, looking like they didn’t even belong in the playoffs. The Bruins may have shown some signs of fading in the last week or two of the regular season—losing their finale to let the Atlantic Division title slip away—but as the playoffs have officially gotten underway, they look like they are exactly where they need to be. Suddenly, they are clicking on all cylinders and burying the Leafs in a barrage of goals (including a hat trick by David Pastrnak in Game 2). It almost doesn’t even seem fair. One of the most important things you can do in a hockey game is score the first goal. It shifts all momentum in your direction while knocking the other team’s confidence down a notch because now they have to play from behind. This is something the Bruins struggled with greatly during the regular season, which is why they’ve occasionally been referred to as the “Comeback Kids.” They found themselves in several situations throughout the year where they had to climb out of a hole, constantly struggling to notch the first goal of the game. Once the playoffs began, this problem had suddenly been solved. 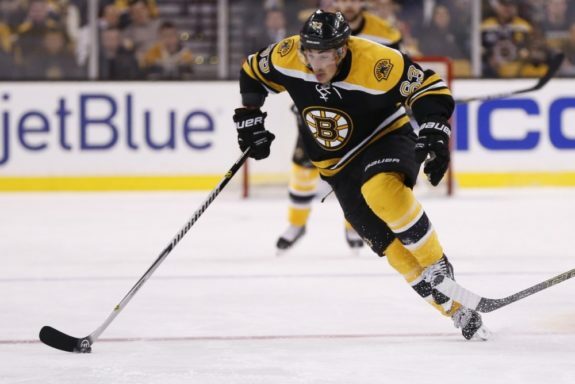 In Game 1, the gritty and pesky Brad Marchand scored the first goal less than six minutes into the game to set the tone. The Bruins then proceeded to pile on, scoring two in the second period and two more in the third to win 5-1. They did the same thing in Game 2, once again scoring less than six minutes in—this time it was the 21-year-old Pastrnak—before unleashing their vicious attack on the powerless Leafs. After that first goal, the Bruins were in complete control, and they proceeded to shower poor Toronto in a relentless parade of goals. They made it look easy. 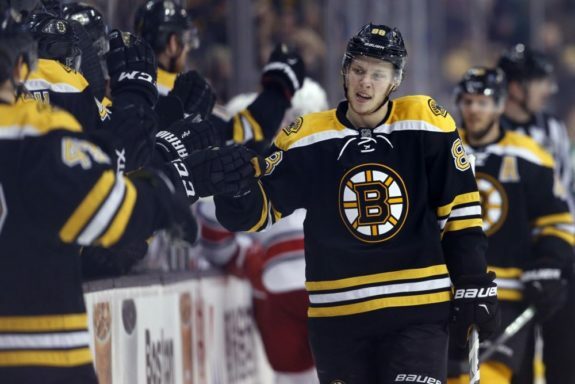 The youngster Pastrnak played the game of his life in Game 2 on Saturday—and he’s already had some pretty big games in his very young NHL career. The Bruins had already put a dent in Toronto’s armor by thumping them heavily in Game 1, but Pastrnak continued to show no mercy whatsoever. He recorded six points in the game—three goals and three assists—as the Bruins ramrodded the Leafs 7-3 to take a 2-0 lead in the series. He scored the first goal of the game in the first period, then scored two more goals in the third period just to add on to Toronto’s brutal beatdown. He also assisted on goals scored earlier in the game by Kevan Miller, Rick Nash and David Krejci. Clearly, the bright lights of the postseason don’t bother the 21-year-old kid from the Czech Republic, because he made scoring three goals and notching three assists look like child’s play. The Maple Leafs are battered and beaten right now after enduring Boston’s relentless attack in the first two games, but they aren’t out. As stated at the top, a hockey series is never over until it’s over. Heading back home to Toronto, all the Leafs need is a single victory to shift the momentum back in their favor, and they are more than capable of getting a win on their home ice. No Boston fan has forgotten what happened against the Philadelphia Flyers in the 2010 playoffs. The Bruins are playing incredible hockey right now, but they can’t afford to let up.